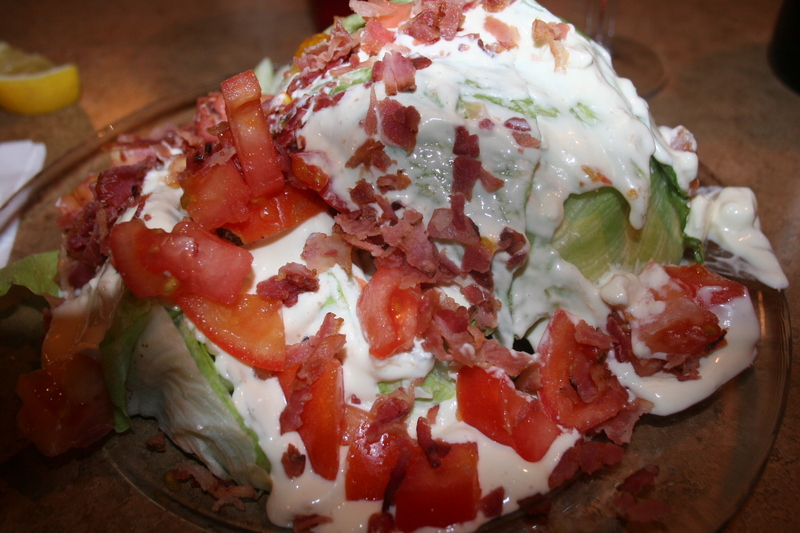 what I have often mentioned as my very favorite salad choice, the Wedge, a nice chunk of iceburg lettuce with tomatoes, bacon bits and blue cheese dressing. The portion at Neena’s was HUGE. I shared some with Kathy but this salad could absolutely serve 2 people. It was excellent. All of us have certain quirks with food and one of mine is cutting my salad into much smaller pieces. 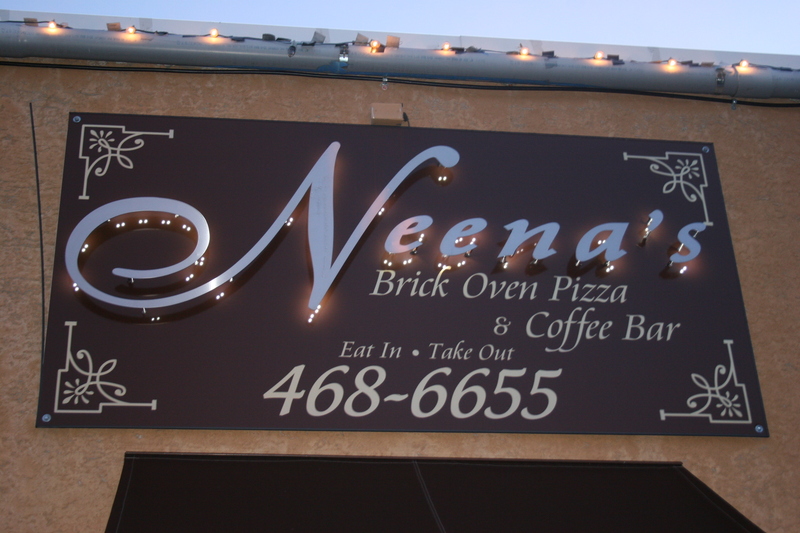 That proved a challenge with the Neena wedge simply because there was so much of it. My wine for the evening was another old reliable, the 2007 O’Reilly Pinot Noir, Oregon. This may be my favorite under $20.00 Pinot Noir and reports are that the 2008 version which has not yet reached the stores here is spectacular. It has a nice soft bouquet, plums and cherries on the palate and a smooth texture. It’s not exploding with flavor but it’s pleasant and went well with my entire meal. 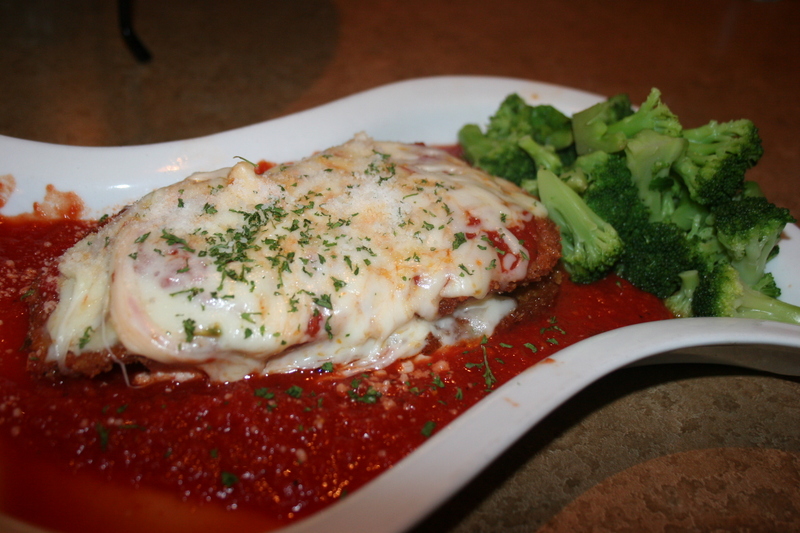 Kathy and Sue both chose the Eggplant Parmesan which is served with a side of pasta. Sue declined a side while Kathy substituted broccoli and ordered a side order of broccoli rabe. Kathy enjoyed her eggplant, maybe because she knows it’s something I would never ask to sample. It looked inviting on the plate but I would need for it to be a chicken breast under the layer of cheese and marinara sauce. I passed on the linguine with crabmeat and chose instead the Lobster Ravioli Antonio, with spinach in a light plum sauce. 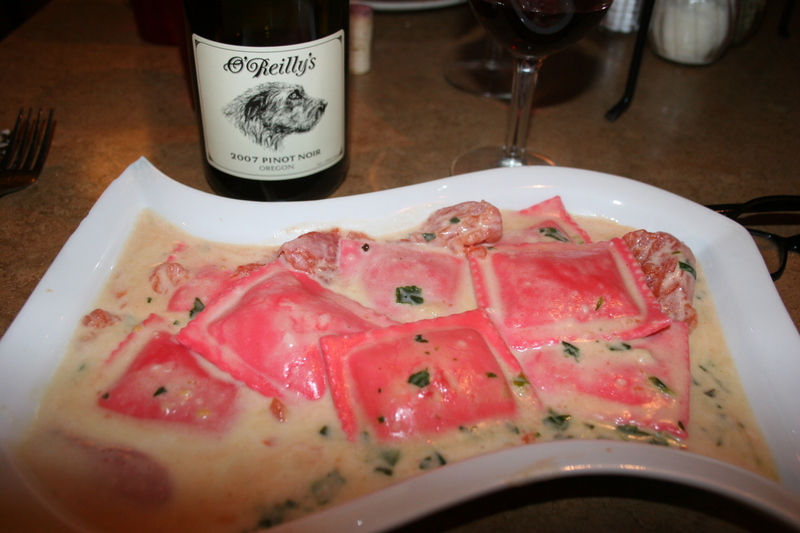 Great flavor in the sauce and eight very nice size ravioli filled with tasty lobster. They really did a nice job with my entree. It was one of those meals that could have made for another meal the next day. Sorry, it didn’t last long enough. 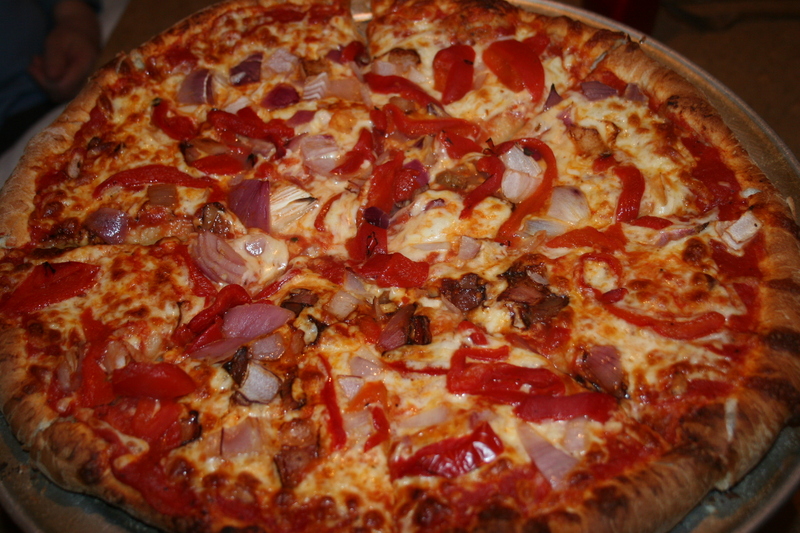 Jerry was in a pizza mood and restaurants with a brick oven usually do a better than average pizza and so he selected one with roasted red peppers and onions. Maybe they knew that he had burned his mouth of the soup and did not want to risk another heat causing injury but his pizza was not hot, warm possibly, but not hot. That was his only complaint. There was nothing wrong with the taste and after eating half he had the other half boxed. I should wander over to his place around noon and maybe we could split the last four slices! 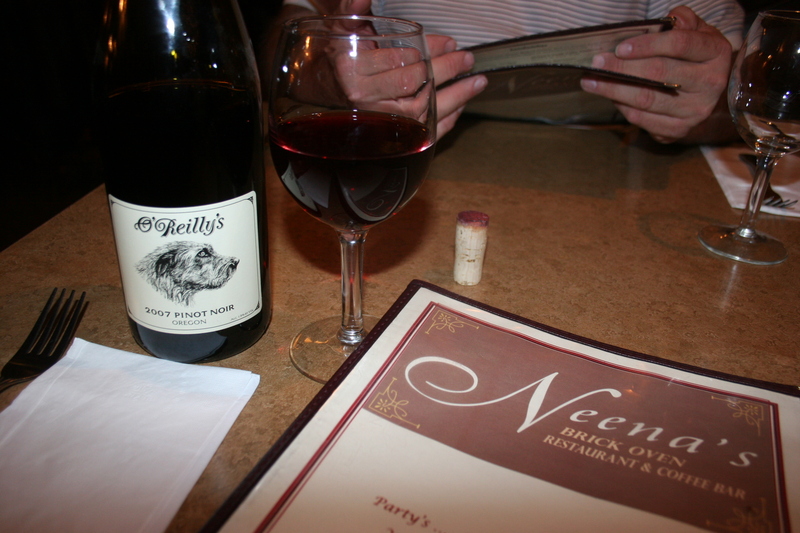 I would have to say that Bobby and Deneen Clark, who moved Neena’s from its former location in Woodbury to its new home in Sewell have a nice place with a great choice of menu items and that explains why there were few empty tables on a friday evening.